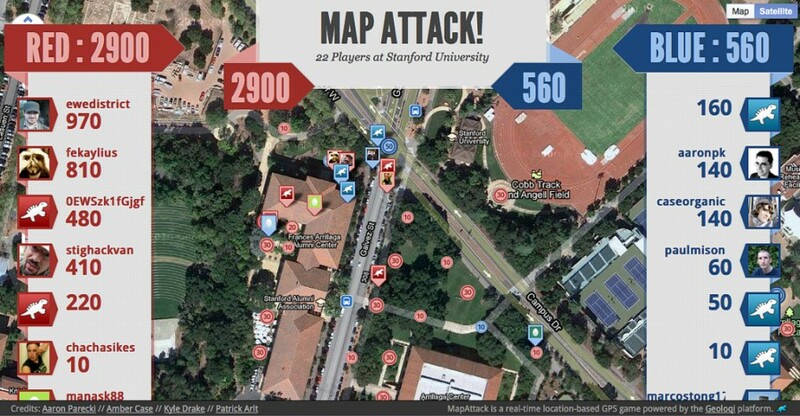 Results from the MapAttack at Stanford University! 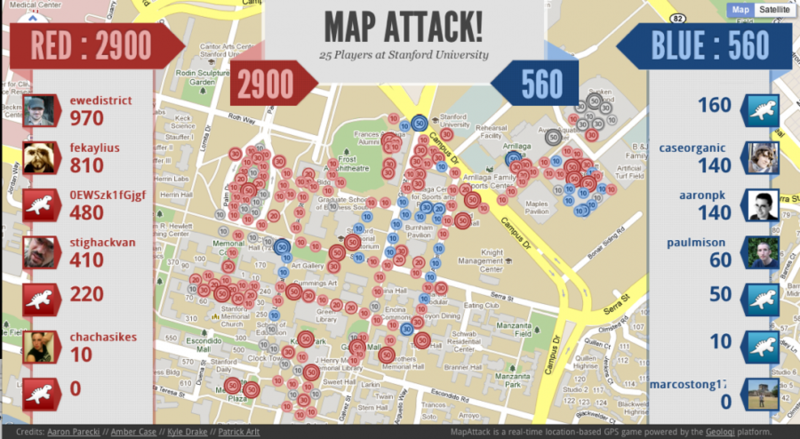 This morning a bunch of us at WhereCamp headed out to play MapAttack, a game based on the Geoloqi platform. 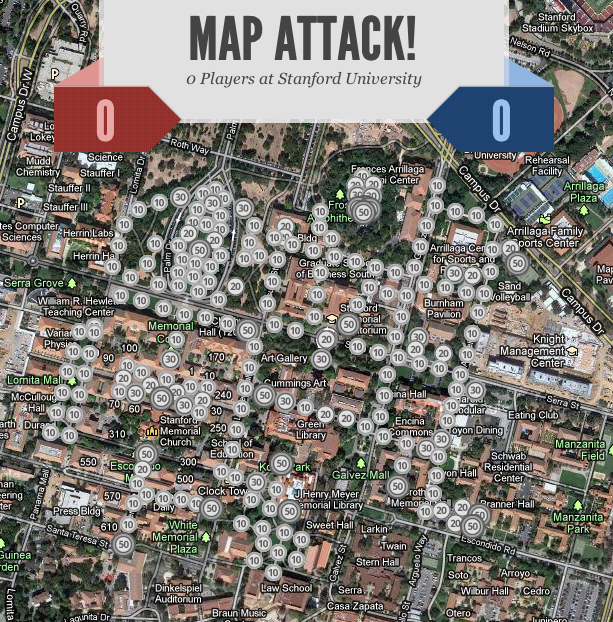 Players subscribed to the MapAttack layer in the Geoloqi app and were assigned to a red or blue team. The game quickly progressed as people rushed out to collect dots. Some, riding on bikes, grabbed points faster than others. Others, like @paigesaez, aimed for large points, finding and capturing 50 point dots before anyone else. 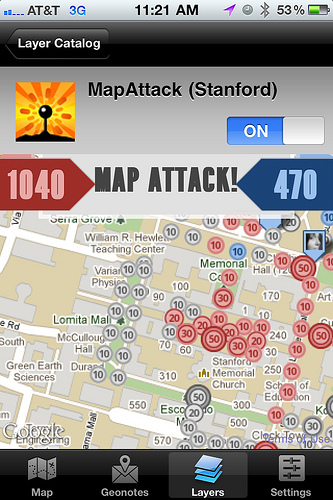 Here’s what the MapAttack game looked like on the phone. The leaderboard updated in real time, and everyone’s locations and movements could be seen. 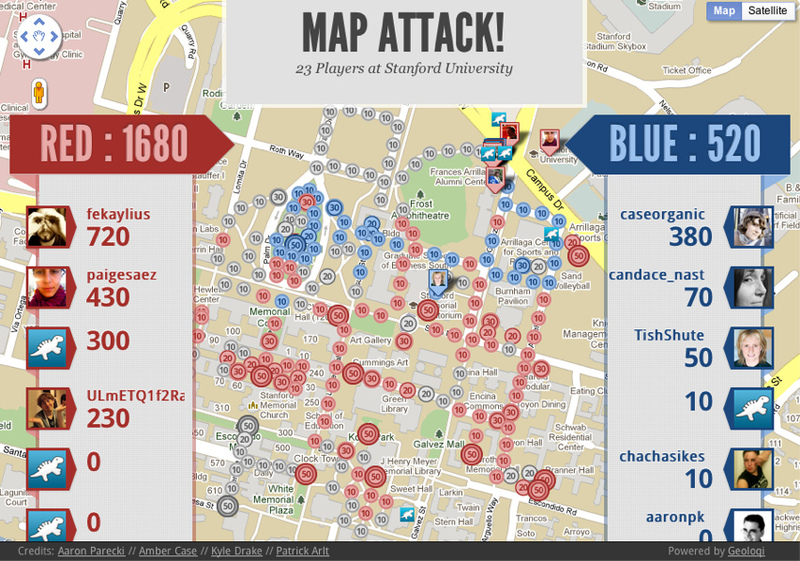 The fierce battle between red and blue teams progressed over time. Red dominated in the lead over Blue through most of the game. One of the players who got most of the red team’s points on the map told us a story of how one of the points was stuck in the middle of a construction site. He went up the construction worked and asked him if he could carry the phone into the site and hold it there until the point was received. That led to an interesting discussion on real-life apps and games between him and the worker. Had he not been playing the game, he would not have had the conversation or even talked to the worker. Red won the game! You can see the end state of the game here! 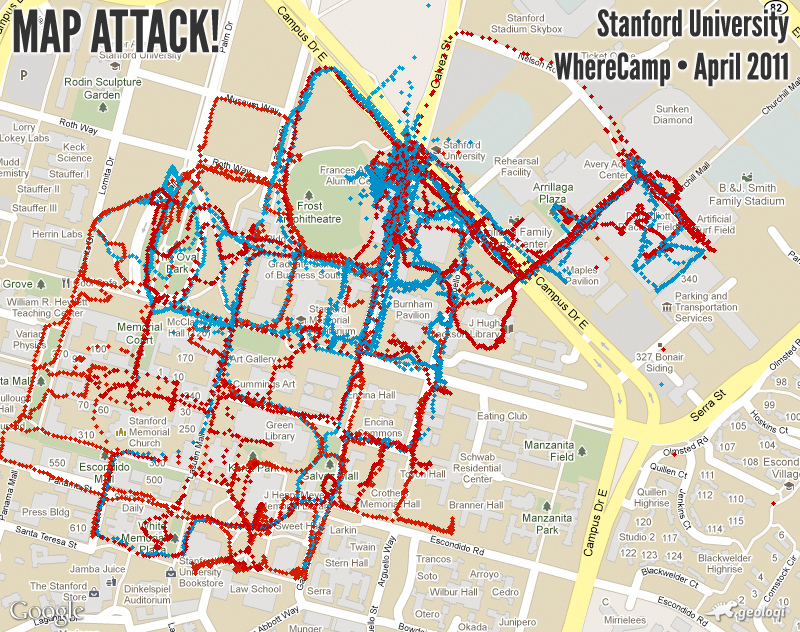 @mpanighetti and @aaronpk went out to draw the word Where on a part of the Stanford University campus. They cranked up the tracker and ran around in the shape of the word. 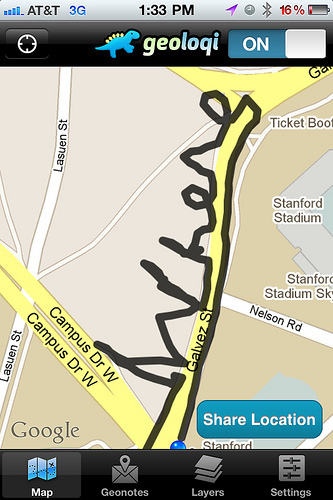 There have been a bunch of pieces of GPS art created with the Geoloqi app. If you have one, send it to us at art at geoloqi dot com! We’ll put it up in a gallery in the future! Thanks to everyone who played and worked on the app. We can’t wait to improve it and bring it to more people! 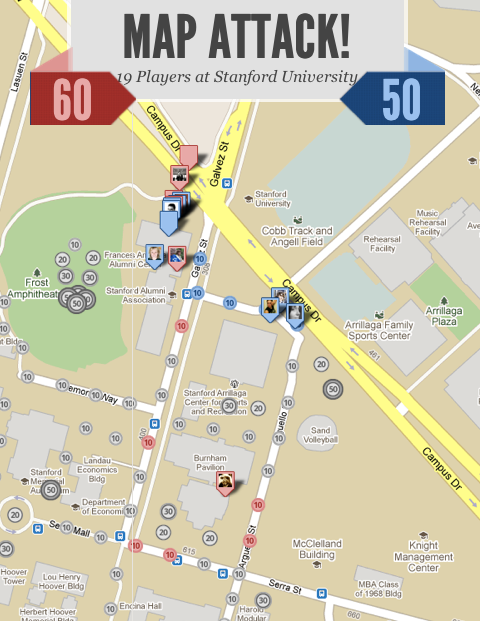 You can keep up on future games by following @playmapattack.